The primary reference text recommended in A Rough Guide for Seventh Grade is Mathematics Around Us. The primary text for Eighth Grade is Mathematics in Nature, Space and Time. These are both great books with wonderful illustrations. I would like to share with you the 4 week main lesson outline that I put together for my children in eighth grade using these texts. I called it “Geometry in Man and Nature”. There are many topics in it that are primarily 7th grade material, either that we did not cover in 7th grade or we used as a review. 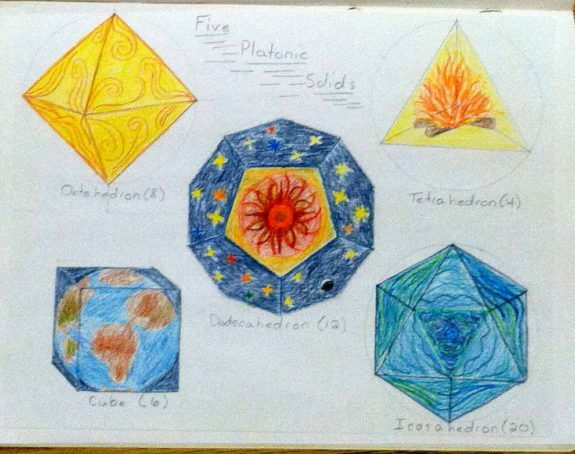 The work on Platonic Solids is definitely an 8th grade topic. Additional sources that I used were the Modeling book for doing the Platonic Solids from clay and Ron Jarman’s Teaching Mathematics in Rudolf Steiner Schools for Classes I-VIII. Then we went on to explore and construct Leaf Shapes and drew these within the compass drawn circle. She put two of these leaf drawings into her main lesson book. Days Three and Four: We looked at shell shapes that demonstrate the logarithmic spiral and she did a free hand drawing of a nautilus. Then she did a full page drawing of the nautilus showing how its proportions exhibit the Fibonacci series. Her text read:” Taking the ratio of two successive numbers in the series (1,1,2,3,5,8,13,21,34…) and then dividing each of the preceding numbers, we arrive at the following sequence of numbers: 1/1=1; 2/1=2; 3/2= 1.5. 5/3=1.666 continuing until 2584/159=1.618033813 or phi. Finally we worked out the old rabbit problem using the series and then went to the piano to experience the keyboard. She drew out a portion of the keyboard showing the black keys ( 2 and then 3 for a total of 5) and the 8 white keys for a total of 13. 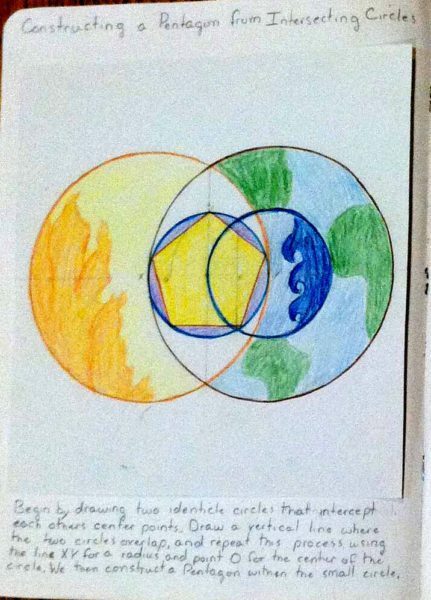 She next did a colored complex pentagram construction and then a drawing of a marine animal showing pentagonal symmetry in the animal. Days Three, Four, Five: Basic Geometric shapes; formula for Platonic Solids, Drawings of Five Platonic Solids: Her first page in this section included a drawing page of all the basic geometric shapes: square, rectangle, trapezium, rhombus, parallelogram, regular pentagon, regular hexagon, regular octagon, scalene triangle, isosceles triangle, circle, kite, equilateral triangle and oval (ellipse). Next we worked with the Platonic Solids. After reviewing a little history of the solids and Plato’s writings on it, we went on to count the faces, edges and points of the solids. She had earlier in the year constructed the five solids out of cardstock. Now we looked at the Faces, Edges and Points (Vertices) of each of the shapes: Tetrahedron ( 4 faces, 6 edges and 4 points); Hexahedron ( 6 faces, 12 edges, 8 points); Octahedron ( 8 faces, 12 edges and 6 points); Dodecahedron (12 faces, 30 edges and 20 points) and Icosahedron (20 faces, 30 edges, and 12 points). She created a listing of this in her main lesson book and then wrote down the formula for the solids: ” F (faces) + P (points) = E (edges) +2. So, 4+4 = 6+2 ; 6+8= 12 +2; 8+6= 12+2; 12+20= 30+2; 20 + 12= 30 +2. 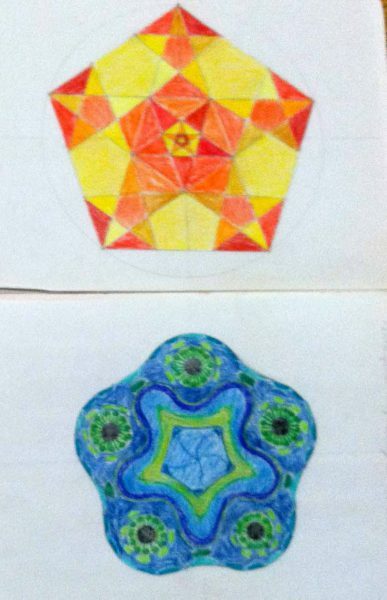 She then did a flat construction of all the five solids in the main lesson book, decorating them in color with Kepler’s earth, air, fire, water and cosmos designs. The Hexahedron or cube is earth; Octahedron is Air; Tetrahedron is Fire; Icosahedron is water; and Dodecahedron is the cosmos. On the last day we did the fun and challenging metamorphosis of the five Platonic Solids using clay and carefully following the instructions in the Learning about the World Through Modeling book. It was an amazing exercise and I recommend it highly. If you have time to add on a fifth week to your main lesson, it would be wonderful to cover the section on Rhythm and Cycles from Mathematics in Space and Time, especially focusing on the Earth’s elliptical path around the sun. We did not have time to do it in this lesson, although we worked on the concepts in Astronomy. As you can see, there are many ways to approach the main lesson material from these books for seventh and eighth grade. Ours was just one approach, but it was one that heightened our reverence for how Creation geometrizes!